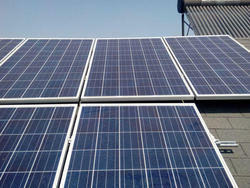 Pioneers in the industry, we offer on grid solar power system and solar grid system from India. The Solar Power Plant System, which we offer, is an efficient ON-Grid & off-grid photovoltaic power solution. It comprises of photovoltaic panels that can be conveniently fixed over the rooftops of residential and commercial buildings. The Solar Power Plant, offered by our company, is capable of meeting the electricity requirement of huge commercial and residential spaces. Solar Power Plant can be customized according to the requirement of the client, it may be rooftop PV systems & ground-based PV systems. Looking for Solar On Grid System ?